In a region teeming with potential and growth, the economies of Southeast Asia have seen an improvement that has surpassed expectations from decades ago. However, over the years, the minimum wage in these countries has become an issue. A disgruntled workforce is left to scratch their collective heads in figuring out how to make ends meet with the ever-rising cost of living. With this in mind, a rise in minimum wage is warranted and is gradually turning from policy to action in the region. It is undeniable that Southeast Asia is an attractive manufacturing and production hub for foreign investors. One of the factors that can be pinned is that workers in the region are generally paid a low wage for laborious and often back-breaking work. However, according to Daniel Kostzer, a senior regional wage specialist for the International Labour Organisation (ILO), it is the discipline and hardworking nature of workers in the region that is the main pulling factor. Even if minimum wages are to be increased, the character and resilience of these workers should be enough to make international companies in the region want to stay. Arguably, it is more cost effective to increase the minimum wage and keep workers and staff happy, which could lead to an increase in productivity, than to depend on technologies that might be more expensive to maintain. Cambodian Prime Minister Hun Sen has recently announced an 11 percent increase in the minimum wage for garment and footwear workers. Such a move is seen as a bid for their votes in the upcoming election, with the government gifting US$5 a month beyond the required minimum salary of US$165. The political motive behind this move should not undermine the fact that there is a rise in Cambodia’s minimum wage, as these workers are not compelled to vote either way. In Thailand, the nationwide minimum wage has been raised for the first time in five years as the country’s military government attempts to do away with a lingering income disparity. Since April, the wage has increased from US$0.16 to US$0.69 per day, depending on the location. “Wages have to rise with economic conditions – the cost of living and economic growth of each province,” said Jarin Chakkaphark, permanent secretary of Thailand’s Ministry of Labour. This decision by the Thai government is necessitated by the country’s improved economy. According to the Organisation for Economic Co-operation and Development (OECD), Thailand’s medium-term growth is expected to settle at 3.6 percent – an improvement from the 2.9 percent average growth between 2011 and 2015. Trade activity has picked up, auguring well for Thailand’s economy, with exports comprising more than three-quarters of the country’s GDP. Recent regulations that have eased frictions of investment and trade, as well as the laying out of the Eastern Economic Corridor project, are anticipated to provide additional momentum. In Indonesia, the Jokowi-led government there had set an 8.71 percent target increase for minimum wages across the nation as workers have to adjust to constant rising living costs. The new minimum wage growth formula is hinged on the sum of Indonesia’s inflation and GDP growth over the past 12 months. According to data from Statistics Indonesia (BPS), the country’s inflation reached 3.72 percent year-on-year in September of last year, while economic growth was recorded at 4.99 percent year-on-year over the same period. In a country that has a problem with the productivity of its workers, an increase in the minimum wage could potentially change the status quo. A report by the OECD indicates that Indonesia’s economy is also in a position to expand by 5.4 percent from 2018 to 2022, approximately at the same pace observed from 2011 to 2015. Growth will primarily bring benefit to the investment climate. On the whole, governments in the region should always have the interests of its people in mind; a justification to why policies are formulated and implemented for the masses. It might be a logical fallacy; a slippery slope, in saying that the output of workers will be higher if the minimum wage increases but chances are, workers will be contented (if not happy) to be able to sustain their own lives, as well as to meet the rigours of living in a fast-paced world that is highly competitive and demanding. 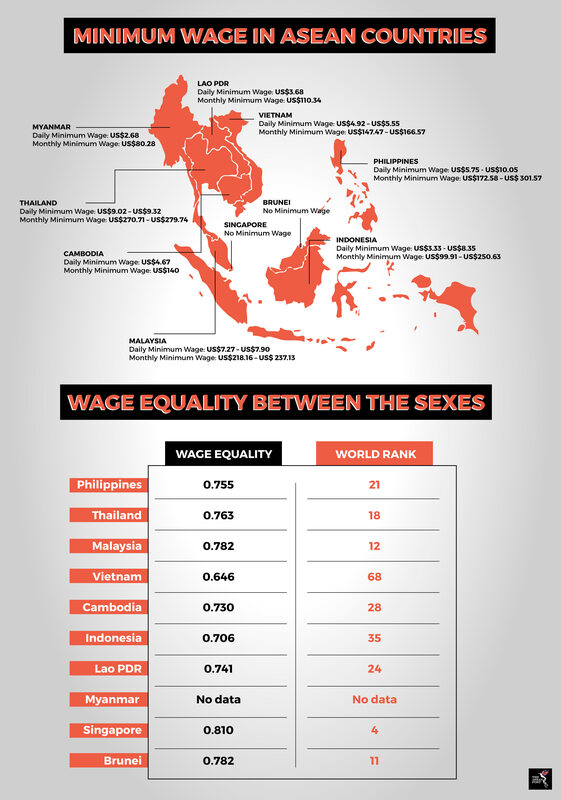 Countries in Southeast Asia are on the right track in meeting this need by increasing the minimum wages of its peoples.